This lift will only roll onto the sizzor lift trailer. It will not be able to get into a 5 X 8. 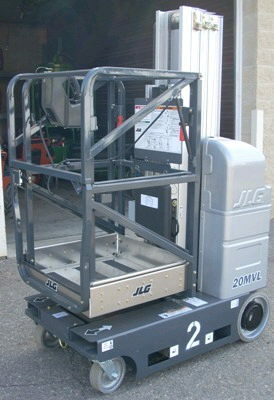 Optional narrow platform 24.5" X 22"
Optional extension platform 49" X 26"
* Please call us with any questions about our lift 20 foot vertical personnel rentals in Burnsville MN, Rosemount MN, Apple Valley, Minneapolis, St Paul, Twin Cities, South Metro,and Dakota County.